This miniature Wild Duck Serving Set distributed by Reutter Porcelain is in one inch (1/12th) miniature scale . 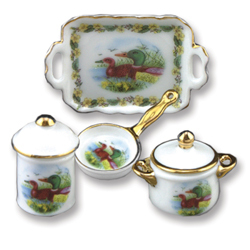 The set contains four stunning pieces featuring the new Wild Duck theme from Reutter Porcelain. This Wild Duck Serving Set - 4pc is supplied by Reutter Porcelain, which generally ships within 1 business day(s) of you placing your order .